From Nigella Lawson's Forever Summer. Incredibly easy. Crispy skin. Tender meat. Full of flavour. Go for it. From Nigella Lawson's Feast. Yum yum yum! They're cooked with shredded lettuce, onion and chicken stock. This recipe brings peas to a whole new level. Looks just like the braised lettuces on this post. The only difference is I used rosemary instead of thyme. It tasted like soap. Don't try it. Chicken pieces are rubbed with thyme and oil, thrown into a roasting tin with lemon wedges and garlic cloves, sprinkled with white wine and baked at "flavour-intensifying low heat" for two hours, before having the oven turned up for the final browning. 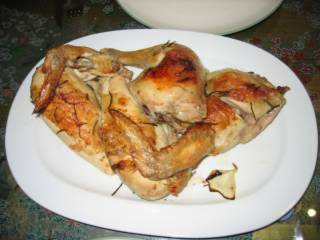 This method of cooking results in very soft meat that just falls off the bone. 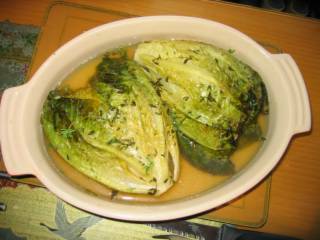 And the braised lettuces are such a wonderful accompaniment! Having made many a roast chicken recently, I had accumulated enough bones to make my own stock to braise the lettuces in, and it was lovely. I'd never thought to cook lettuce before! The cooking process make them soft and flavourful. I had mine with a glass of lovely cold New Zealand Sauvignon Blanc. Perfection. I made this once, a couple of years ago, in our old kitchen. But, I think I got the flavouring wrong, and it only tasted OK. So I never made it again, and the extra black rice I had bought just sat in the cupboard. On Tuesday night, however, I came home to find my mum cooking the remaining black rice in our rice cooker. She had come across it in the cupboard, and had no idea what it was (sweet, savoury, glutinous, sticky, wild, dyed), so she decided to cook it to find out! 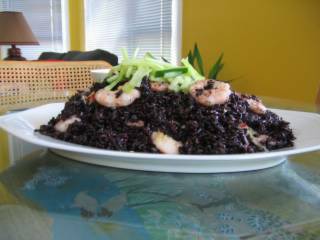 With all this black rice just sitting around, I was compelled to give this recipe another try. And it turned out lovely! I think it's best as a starter instead of a main, so if I make it again, it will be in smaller quantities, in small bowls, and it will be the beginning of a Vietnamese-style meal. Delish! Forever Summer is currently screening on the Lifestyle channel, which seems to have inspired me to revisit this lovely book and its fabulous recipes. Forever Summer was the first Nigella book I ever bought, and, on retrospect, started this new-wave love of cooking which shows no sign of abating. I watched an episode last night, with my brother, who kept giggling at the sexual "innuendos". (Like anytime she said "juicy" or "firm" or "lovely" or "Mmmm..." or squelched things around in a pan, or if the camera focused on her breasts, or if she smiled at the camera...) Sheesh. I was just watching it for the food! 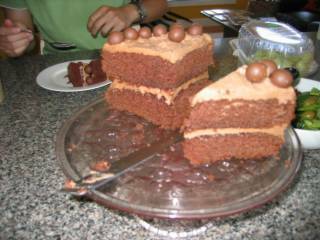 That Chocolate Malteaser Cake (see two blogs ago) is one yummy cake. And the day after that I took a piece to uni for Paul to try. And the day after that (today, Wednesday), Mum & I polished off the last piece with a cup of coffee. It's such a dreamily light afternoon tea cake! (Sweet, but not stodgy and filling, or "glotally thickening", as Nigella might say...) I'm used to making big-fat-heavy dessert/depression cakes, and this one is different. Still yummy enough to be worth all the calories it contains, but light enough (in taste and texture) not to induce immense feelings of guilt upon consumption. And the malty, Horlicks taste! Yummo. Sarah: I made a chocolate cake. An: YAY!... during lunch... Can we have cake now? 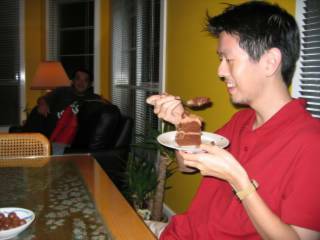 Allan: Wow, I'm totally amazed by your cake. It looks better than Nigella's. I never thought to place any maltesers in the center of the cake. I defy anyone else to top the one you made! Unfortunately, I didn't come up with the idea of the second row of Malteasers. I put the two cakes together with the domed sides facing each other, and panicked when I realised there wouldn't be enough icing to fill the gap! But, it just goes to show that sometimes the best ideas come from accidents. 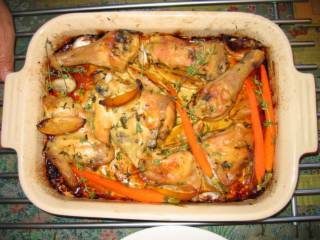 Ooh, my first recipe from Jamie's Dinners! How exciting! And it totally rocked! 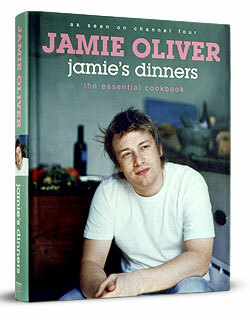 The roast chicken is from the "the top ten" chapter - the top 10 list of favourite all-time dinners (as chosen by Jamie and voted by fans through his website). 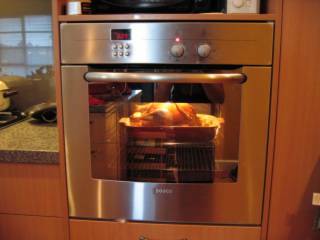 Chicken in oven... only 9 minutes to go! 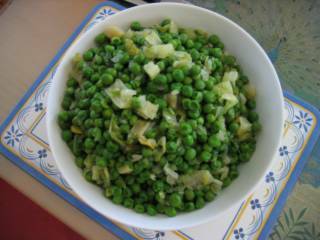 I served it with some boiled peas. I was gonna do mushy peas but the processor was full of icing (see "Chocolate Malteaser Cake" Blog below this one). 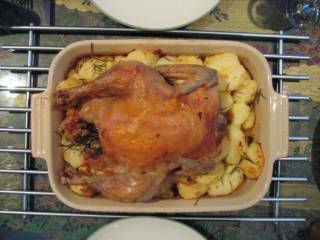 If I make this again (nay, WHEN I make this again), I'll cut up the potatoes smaller, and make sure to coat them properly in the rendered chicken fat for extra crunch. 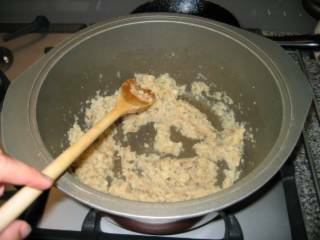 Plus, I will cut off some of the excess fat from the chicken, partly for health purposes, and also to prevent a big pool of unnatractive juices forming in the pan. This time, rather than being completely dry and crispy like proper roast potatoes, the potatoes melded a bit in the juices, taking on a kinda gratin-type vibe (i.e. crispy on top, soft on bottom). Still extremely tasty though. Mmmm... fluffy potato in chicken juices... so so so addictive! 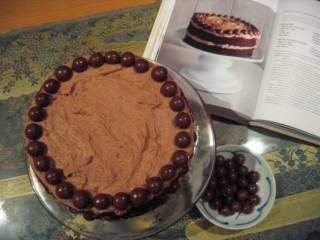 My first cake from Nigella's "Chocolate Cake Hall of Fame" chapter in Feast. The Chocolate Malteaser Cake comprises two chocolate malt cakes, sandwiched together with a chocolate malt butter cream... It is malty (thanks to the addition of Horlicks), very light (thanks to the addition of baking powder and bicarb), and thus, very easy to eat. I made it this afternoon whilst making dinner. It's very easy to make, but it seemed to be quite a thin and wet batter - thankfully the 1 inch of cake mix in each tin ended up rising into proper cake thickness! Also, the recipe makes JUST enough icing to cover the cake - so you really can't eat any whilst you make it, unfortunately. 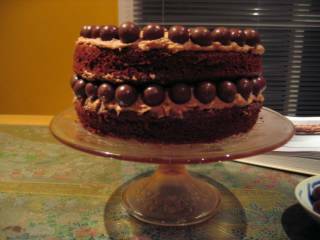 I studded extra malteasers between the two cakes to fill in the gaps. 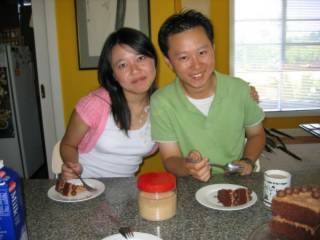 It was really nice, but I think that my favourite chocolate cake is still the Chocolate Fudge Cake from Nigella Bites. This lighter, fluffier, malty cake was nice however, for a change. President of Duffman Corporation: Mmm... extra malty. Not that he'll ever know! We shared it with Liam M (he of the quote at the top of my blog) and Timmy K. Nigella says "8-10 slices", which must mean "8-10 huge mamma slices" because we had 1 slice each and ate just half the cake (6 slices in total). I had mine with a nice refreshing glass of cold milk. 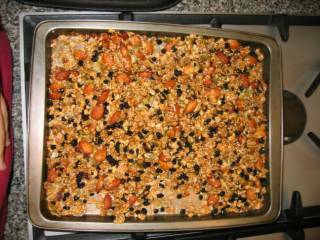 The first time I make a non-Nigella recipe in months deserves a blog! Soba noodles are Japanese buckwheat noodles, normally eaten cold on a hot summer day. Jill Dupleix (Australian food writer) says that they are "more cooling than an air conditioner and a swimming pool combined". How true. They contain protein, rutin, vitamin E and vitamin C, and taste "assertively earthy and nutty", according to Terry Durack (who is, incidentally, Jill Dupleix's husband). Nothing beats hungrily slurping up lightly dressed, cold soba with chopsticks. The talking stops as the eating takes over. This recipe, from Terry Durack was published in the latest Vogue Entertaining and Travel, and made a fabulously easy, light and tasty dinner last night. 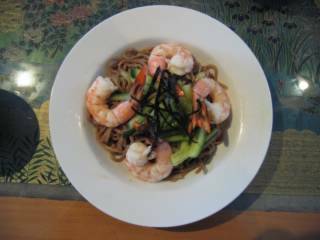 Cooked, chilled soba noodles are tossed through a dressing of mirin, soy and vinegar, and topped with slivered cucumber, poached prawns and toasted nori. Healthy and delicious. Terry Durack is the author of Noodle, available at good bookstores and Amazon.com. Jill Dupleix is the author of Old Food, sometimes available at bookstores (but not at Amazon.com, unfortunately). Anchovies... onions... garlic... cooked slowly in a pan, and tossed through long pasta. Sounds like a recipe for success, right? Well, unfortunately not. This recipe comes from the Venetian Feast chapter in Nigella’s Feast, and according to the domestic goddess herself, “the anchovies here are mellow and, with the soft-cooked onions, have a savoury but honeyed intensity – not strong, just deep-toned and harmonious”. This is fine for all you weirdo anchovy-haters out there, but what about us, the anchovy-lovers? 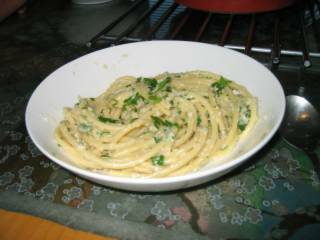 Of course, this is not the fault of the recipe – as I read the Nigella’s recipe and description, I should have realized that we weren’t going to get a strong anchovy hit out of it, but oh well. Live and learn. But in the finished product, sadly, the sweet onion taste overpowered the poor little anchovies. In fact, I think that “Pasta with Onion Sauce” would be a more appropriate title. I thought it tasted ok, but wouldn’t rush to make it again, especially considering the lukewarm reception from my family. Daniel: This is pretty garlicky. Mum: This could do with a lot more anchovies. 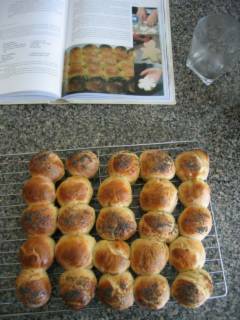 On Saturday, I was alone at home and was browsing through the messages on the Nigella.com forum, and noticed that a lot of people there loved the “Soft White Dinner Rolls” from the Kiddiefeast chapter in Nigella’s Feast. I was bored, so I thought that a little light baking would be just the thing I needed. They were very easy, and delicious! I find bread baking hard, so was pleasantly surprised by the simplicity of this bread. By sheer coincidence, (not my brilliant culinary timing, unfortunately), they came out of the oven just as my parents returned home, so we ate them together. I ate mine spread with Vegimite and with strawberry jam. Delicious. Bread rolls... with the recipe in the background. Adri: Can I have another one? Dad had wanted rack of lamb for a while, so on Thursday we headed around the corner to Rendinas Butcher, the best butcher I have ever been to. The meat (as I have blabbed on and on about before) is biodynamic and thus incredibly tasty. It is slightly more expensive than the average place, but so worth it. Dad and I walk up to the butcher and look in the window. Sarah: Ooh! 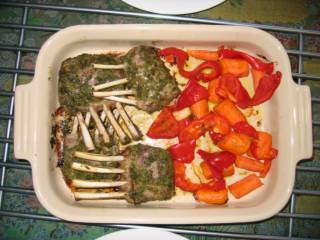 Only $10.49 a kilo for the lamb racks! Dad and I walk into the butcher. Butcher: Hi, how are you going? Sarah: Good thanks! I would like some racks of lamb… enough for four people. Butcher: How about four racks then? Dad: looking suspiciously at the size of the lamb racks… That’s not enough! Can you make it five? Sarah: Well, make it six then, so we can share them more easily. Butcher: packing them up Ok… that’s $62.95. Sarah: What!? Isn’t it $10.49 a kilo? Butcher: No, sorry, it’s $10.49 each. I can swap them for something else if you want. Sarah & Dad: Nah, it’s ok, we’ll take them. Dad pays and we walk out of the butcher. Sarah: Dad, I’m so so so sorry! So that night I decided to save two of the racks for the next day, and very guiltily cooked four of them according to Nigella’s recipe. Long story short, it was so delicious (a combination of excellent meat with an excellent recipe) that we greedily gobbled it up. And went back to the butcher the next day to buy more lamb for dinner. This was dinner tonight. The recipe is from the book Nigella Bites, in the Slow-cook Weekend chapter. I’ve read this recipe loads of times, but have never been really tempted to cook this, until I saw her cook this on TV last week, and realised how tasty it looked. I got lamb shoulder from our fantastic local butcher, who is really friendly and specialises in organic, free-range and biodynamic meats. Fantastic. 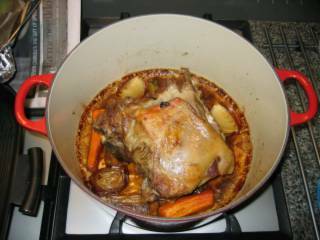 You brown the lamb in a pot and then cook it in the oven with some root vegetables (for flavour) at a really low temperature for hours until it is cooked and tender. As I bought the lamb late in the afternoon, I only cooked it for three hours. Once it comes out of the oven, you hack at the meat with various implements to shred it into bite-size pieces. I started with a kitchen knife, a fork and a barbecue fork, but finally resorted to my bare hands, which are now slightly burnt and cut up from the hot meat and sharp bones. Painful, but worth it, because we were starving and the meal was delicious. 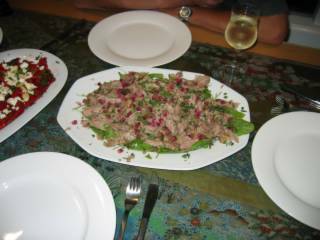 The recipe calls for just eating the lamb as it is, sprinkled with pomegranate and mint, but I put the lamb shreds on top of rocket and baby spinach, tagliata style. Besides, I can’t handle a meal without a salad! I served the lamb (as per Nigella’s suggestion) with char-grilled red peppers topped with feta cheese and almonds. Absolutely fantastic. I can’t recommend this enough. We polished it off quickly, even though my brother only had a tiny bit because he was about to go out. We have just returned from a month in Malaysia, eating our way through. 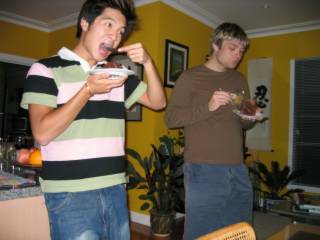 Here is the first in a series of posts about the food we ate. Malaysian food predominantly a mix of Malay (i.e. 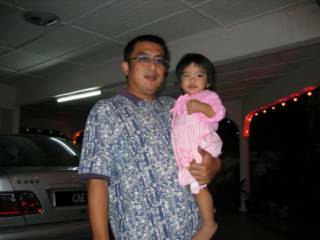 Malaysian Muslim), Chinese and Indian food, although, of course, there are other influences (e.g. British colonialism etc). 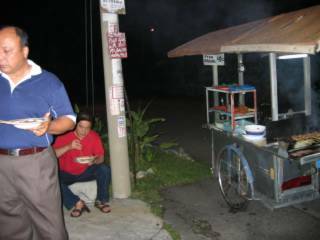 But the most important thing (for me, anyway) about eating in Malaysia is not necessarily what you eat, but how you eat. People eat 4-5 times a day. There's breakfast, lunch, tea, dinner and supper... and that's not including snacks and little treats (of which there are many). There are always food shops open. 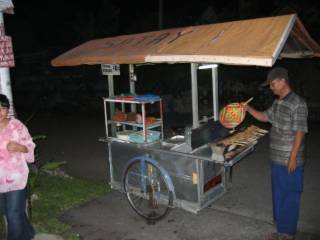 Even at 3am in the morning, you will be able to find a curry shop, or a little kopitiam (coffee shop) in which to have a drink. 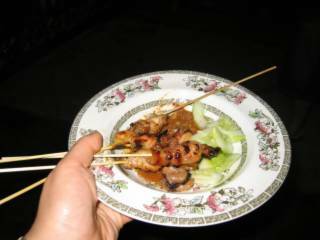 All social events revolve around food, and when you meet a friend, the common greeting is "Have you eaten yet?". 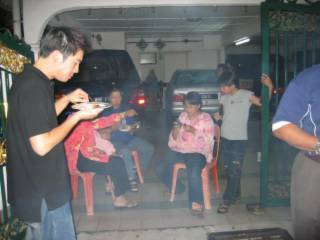 Sharing food itself can be a social event, and in the case of the older relatives especially, sharing food is sharing love and friendship. And it's cheap! So so cheap! 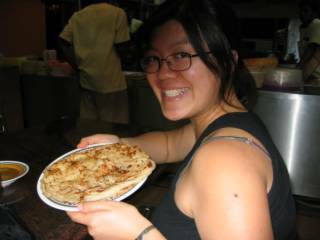 We arrived in Kuala Lumpur at about 10pm (that's 1am Australian time), and after dumping our bags at our cousin's house, went straight to a local (southern) Indian shop for Roti Canai! That's flaky Indian bread, cooked on a hot griddle, served with curry for dipping and eaten with the hands. 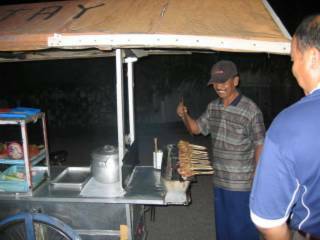 The best roti is crispy on the outside, soft on the inside, and definitely cooked all the way through! What a great way to start our trip!